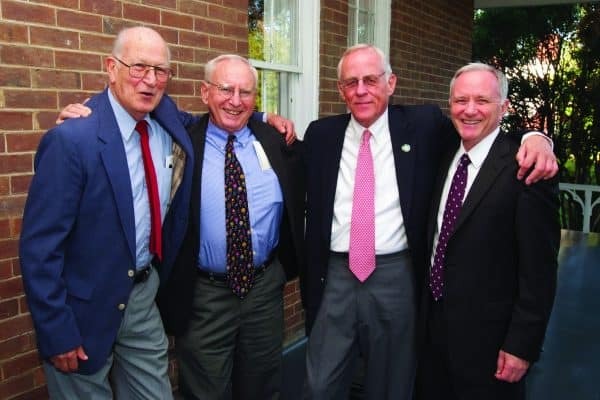 Lew John ’58 (second from right) celebrating his 2013 Distinguished Alumnus Award with (from left) Ed Spencer ’53, Uncas McThenia ’58, ‘63L and then president Ken Ruscio ’76. I started at W&L in July, 2000. At a few points during the previous eight months, I had been on campus. The first of those occasions was for my final interview. Then there was a house hunting trip with my wife. Later came another house hunting trip. On that final occasion, I was invited to a retirement party for Prof. John DeVogt. At that gathering, John’s 38 years of service to the university impressed me. I remember sharing that observation with a soon-to-be colleague who immediately started pointing out the folks at the reception who had been at W&L as long or longer. I would learn of others later, in the Williams School, in the College, and in the Law School. John Gunn, Joe Goldsten, Jay Cook, Buck Buchanan, and “Easy D” Hughes are a few of those in the Williams School that are legends. Each, like John DeVogt, had retired by the time that I started my work at W&L. Cleve Hickman, Sid Coulling, Westbrook Barritt, and others were among the names from the College that routinely surfaced as storied faculty. Roger Groot and Uncas McThenia, to name but two, had that sort of reputation in the Law School. There were, not surprisingly, quite a few of that stature who were still teaching at W&L when I arrived in 2000. Larry Peppers, Chuck Phillips, Pam Simpson, Mike Pleva, Nancy Margand, Larry Boetsch, Bob DeMaria, Ed Craun, and Harlan Beckley are but a few of the legendary faculty with whom I had the good fortune of working in various capacities. Lew John was another of those. I just learned tonight of Lew’s passing. Lew had a voice that made you stop and take notice. His laugh, equally deep and resonant, couldn’t help but make you smile. His love for the university resonated much like his laugh. He cared about this place. He served in several key roles. I knew him as Prof. John, a senior colleague in the Williams School. Many of the alumni know him as Dean John, from his days as dean of students. I can only imagine the ways in which his deep baritone voice served him in that role! We have tried to build on some of the academic initiatives that he helped cultivate, not the least of which is our British politics program. It now includes summer internships along with coursework on contemporary Britain. It has since inspired a similar program in South Africa. We hope to have additional programs in Latin America and Asia at some point. We have Lew to thank for paving the way. I hope that we also continue his broader dedication to the university, and that of Pam, and Sid, and Chuck, and Joe, and Jay, and Wes, and Roger, and others before them. I knew some better than others, and a few only by oral history. They each had their own perspectives on the job that we all do. Whatever differences they had, they each placed the welfare of their students and the welfare of W&L at the forefront as they went about their jobs. May it always be so for each of us.